Professor Strahler will serve as the Creative Director for the entire Art Department and will work closely with the Art Director in running the creative department and the completion of the magazine. Below are all of the available positions. The Art Director (AD) will plan, develop, lead, execute and oversee the creation of the entire magazine, including the design and photography. The AD will be responsible for managing the design team - in coordination with the instructors - to ensure quality control and the completion of the final product. This position will also be responsible for creating and oversee that the Assistant Art Director maintains the schedule for the entire art department, and coordinate schedules accordingly with the Executive Editor. Direct the design, concept and on-time creation of all magazine elements including photography, social media, website and digital branding. Help in establishing a visual identity and style guide for the magazine. Responsible for setting the schedule for all art production and managing workflow. Create and lead the design implementation of projects incorporating copy, innovative visual design and brand assets. Assist in the direction of conceptualizing photography and photo shoots. Organize all creative and production work to meet deadlines. Maintain an archive of the creative files on a daily basis. Managing and maintaining the folder structure of the magazine. Audit magazine and website for brand consistency. Work closely with web developer to ensure visual quality of all digital images on the site including functionality, image cropping, color correction, and image optimization. Assist with managing freelance graphic designers, photographers and other artists. Will require to come in and stay after the scheduled meeting times, and may need to work some weekends. 1-2 courses focusing on design or layout. Proficient in: Adobe InDesign & Photoshop; Component in: Illustrator. Strong prioritizing, interpersonal, problem solving, presentation, project management, & planning skills. Self-motivated with critical attention to detail and deadlines. Required to apply: Resume & portfolio of design examples. The Assistant Art Director (AAD) will assist in planning, developing, and executing the creation of the entire magazine, including the design and photography. The AAD will be responsible for assisting the Art Director with any tasks or duties assigned to them - in coordination with the instructors - to ensure quality control and the completion of the final product. This position will also be responsible for maintaining the design schedule for the entire art department, and coordinating schedules accordingly with the Executive Editor. 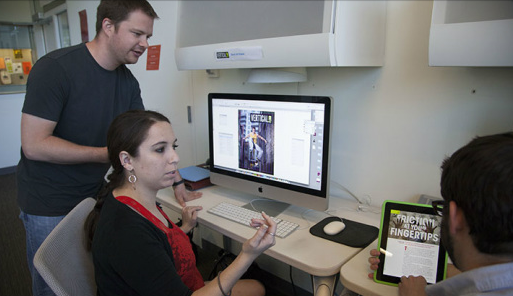 Research current design and graphics trends in digital magazine publishing. Assist with the design, concept and on-time creation of all magazine elements including social media, website and digital branding. Review, manage and follow weekly production schedule. Work closely with Art Director to ensure visual quality of all digital images on the site including functionality, image cropping, color correction, and image optimization. · 1-2 courses focusing on design or layout. · Proficient in: Adobe InDesign & Photoshop; Component in: Illustrator. · Strong prioritizing, interpersonal, problem solving, presentation, project management, & planning skills. · Self-motivated with critical attention to detail and deadlines. · Required to apply: Resume & portfolio of design examples. The Digital Media Managers will plan, develop, execute and evaluate the interactive components of the magazine. These individuals will work directly with the Art Director and Assistant Art Director with the development of the magazine. The ability to manage and implement digital publishing interactive components will be essential to one's success in this role. Work with writers and editors to coordinate visual components needed for each story. Responsible for the creation and implementation of all interactive components. Assist in the design, concept and on-time creation of all magazine elements. Ensure visual quality of all digital images and videos in the magazine. Managing and maintaining the folder structure for each interactive component. Review and follow weekly production schedule created by the AD & AAD. Audit magazine for brand consistency. Provide the AD & AAD weekly reports on completed assignments. May require to come in and stay after the scheduled meeting times, and may need to work some weekends. · 1-2 courses focusing on design or layout & 1 course using DPS components. · Proficient in: Adobe InDesign & Photoshop. · Proficient in all Adobe Digital Publishing Suite authoring components, including Folio Builder, Overlay Creator, and Folios/Articles. The Photographer will be responsible for the creation, acquisition, shooting, editing and presentation of all photographs. This position will accountable for the quality and quantity of the photography for the magazine, and will need to be able to work with short deadlines. As part of the Art Department, this position will be involved in the creative process and vision of the magazine, and will work directly with the Art Director and Assistant Art Director. The ideal candidate will work to any and all ethical and legal standards. Work with writers, editors, and art directors to coordinate and conceptualize photography needed for each story. Responsible for the coordination of photo shoots with the assistance of the AD or AAD. Ensure visual quality of all photography in the magazine. Managing and maintaining the folder structure for all photography. Maintain an archive of photography on a daily basis. Review and follow weekly photography schedule created by the AD & AAD. Travel: There may be times you will be asked to travel with creative teams. · Photography degree preferred or proof of completed photography courses. · Proficient in: Adobe Photoshop or preferred photo editing software. · Understanding of legal and ethical standards of photo copyright. The Photo Assistant/Editor will be responsible for assisting the photographer with the creation, acquisition, shooting, editing and presentation of all photographs. This position will be on a part-time basis, meaning it will be determined by the needs of the photographer and art department. Work with the photographer and art directors to coordinate and conceptualize photography needed for each story. Responsible for assisting the photographer with any photo editing needs or coordination of photo shoots. Will be responsible for other magazine responsibilities, such as writing or editing, since this is only a part-time position. The Videographer will be responsible for the creation, acquisition, shooting, editing and presentation of all video. This position will accountable for the quality and quantity of the video for the magazine and online, and will need to be able to work with short deadlines. As part of the Art Department, this position will be involved in the creative process and vision of the magazine, and will work directly with the Art Director and Assistant Art Director. The ideal candidate will work to any and all ethical and legal standards for video. Work with writers, editors, and art directors to coordinate and conceptualize video needed for each story. Responsible for the coordination of video shoots with the assistance of the AD or AAD. Review and edit video stories. Ensure visual quality of all video in the magazine and online. Managing and maintaining the folder structure for all video. Maintain an archive of raw and finalized video files on a daily basis. Review and follow weekly video schedule created by the AD & AAD. · Experience shooting and editing video. · Proficient in: Final Cut Pro or preferred photo editing software. · Competent in: Garageband or Audacity. · Understanding of legal and ethical standards of video copyright. The Social Media Manager (SMM) will be responsible for developing the social media strategy to support the magazine and stories. This position will plan, develop, lead, execute and oversee the creation of the social media accounts to provide daily updates about the Capstone project. In addition, the SMM will create documentation for how social media will be used by the magazine to meet communication and marketing objectives. This position will work closely with all staff members and report directly with the instructors. Develop and deliver documentation on the social media strategy for the magazine. Create a social media campaign for the launch of the magazine. Manage and maintain social media platforms on a daily basis throughout the six-week capstone. Research and report on emerging social media platforms. Coordinate with the Art Director, Photographer, and Videographer on the creation of visuals for the social media platforms. Responsible for creating and maintaining the social media editorial calendar. Work closely with art director and web developer to ensure the integration of social media with the magazine. The Web Developer will plan, design, develop, lead, and execute the creation of the web site for the magazine. This position will be responsible for developing and inputting stories/story components onto the website. The ideal candidate will have a fundamental understanding of editing a Wordpress template. This position will work closely with the Art Director to ensure brand consistency between the magazine and website. Create and lead the design implementation of the website, innovative visual design and brand assets. Direct the design, concept and on-time creation of all website elements including website, story components (photos, video, etc. ), social media, and digital branding. Responsible for setting the schedule for all website production and managing workflow. May be required to come in and stay after the scheduled meeting times, and may need to work some weekends. 1-2 courses focusing on design and web development (ICC565). Proficient in: Adobe Photoshop, Wordpress, HTML/HTML5, and CSS/CSS3.